Oh my. These kale chips are amazing. I picked them up at a little health food store in the Pittsburgh suburbs. I was drawn in when my eye caught the words “mango” and “habanero”. 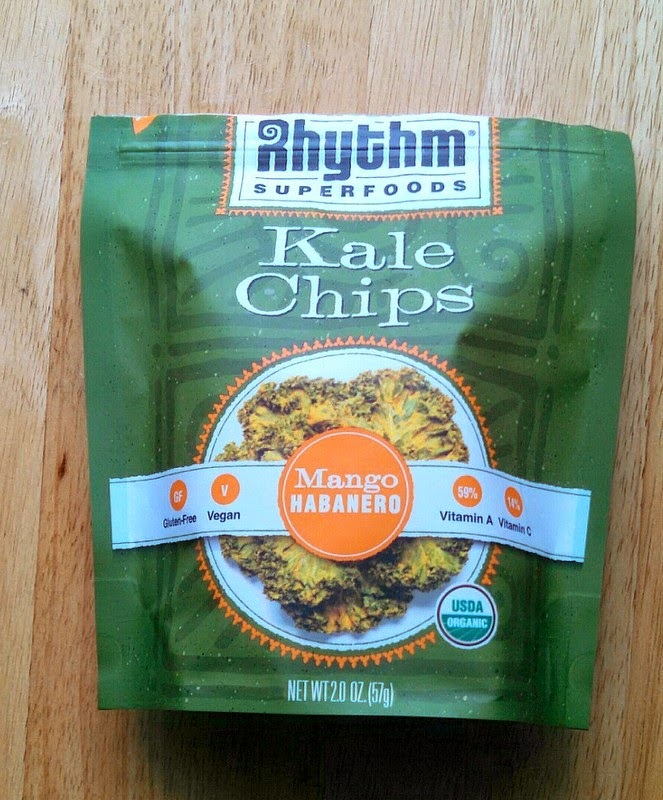 This flavor is unique to other kale chip offerings, and I love mangoes and heat. I really couldn’t go wrong with this one. In all honestly, I rarely buy kale chips since I own a dehydrator. It’s much more cost-effective to make them at home, and it’s way more fun coming up with flavors that you can’t buy in the stores. Still, I do love to pick up a bag as a treat from time to time! Rhythm Superfoods is new to me, so that (aside from the flavor of the kale chips) was one of the main reasons I bought these. I love to try new things, for my own enjoyment and to spread the word on fantastic vegan foods. My favorite thing about them? The flavor. At first, you get the smooth, fruity taste of the mango, and then when you think you’re in the clear from any spiciness, it hits you. Even better is that the mango is just sweet enough to straddle the sweet/savory line, and the spice is nice and hot, but won’t leave you feeling like your tongue is falling out. When I looked at the ingredients and saw sunflower seeds and tahini instead of cashews, I did a little dance. Cashews don’t always digest so well for me (and many other people, too). They can sometimes make my stomach feel heavy and unpleasant, and can even flare up my mold sensitivities. In fact, when I was first recovering from my mold-induced illnesses, I never ate cashews. Since that phase of recovery lasted a long time, I discovered that sunflower seeds can be substituted in many of the recipes calling for cashews. You might need to tinker with the sweetener levels, but it works beautifully. I still like to keep my cashew intake low, so I really love that they use sunflower seeds and tahini in this. Another thing I loved about these kale chips is the thin coating of dressing on them. It seems that most kale chip brands have figured out that if you coat the leaves of kale thickly with the flavoring, the chips will stay crunchier. I’ve tasted some kale chips that had very light dressing on them, and I have to say, I was not pleased at all with the limp, chewy leaves. These, however, are a nice middle ground. They’re not the crunchiest out there, but they’re not stale at all either. They’re quite good! They’ve managed to keep a light coating without sacrificing the crunch factor. For those of you who haven’t had kale chips, you may think there’s a big difference in the heavily-coated ones and these. Not really. Not as far as taste, that is. The reason it impressed me was because it lowers the overall fat content of this product. You can eat the whole bag and still consume less fat than a 2 Tbsp serving of nut butter or a 1/4 cup of nuts or seeds. In other words, I get a healthier amount of fat for a snack and don’t feel sluggish from it! I can’t think of any negatives about this product (other than the price if you’re on a budget, but that’s every kale chip out there!). If you want to treat yourself, or are looking for a fun snack to munch on with your loved ones, I’d highly recommend these kale chips.